awww! he is soooooooo cute! Hello. Well, I have never heard of that type of rodent. But I know of a kind that looks like it- EXACTLY like it. It is called a nutria. They're are many of them in New Orleans. (Where I am right now.) Could they be the same thing? Hmm... I really dont know! But Where DO you get these ideas of eating rodents. ahahaha. That is just VILE. hahaha! I love rodents and this is the coolest one I EVER seen! He looks like a nice sleepy wombat with thinner legs. It's better then a fish. Aww! He's adorable! I want a capybara so bad now!!! Of course, my mothers calls the hamster I have a rat, so I think that's as far as I'm getting for rodents NOW, but I can dream! I love that look on his face. Having known many rodents, I can tell that's the universal look of a good rodent. I want one!! Where can you get them??? 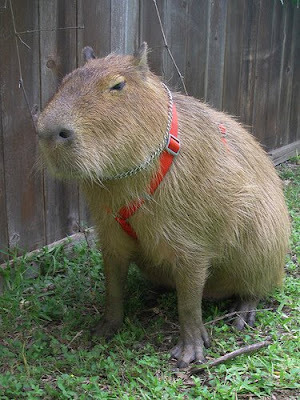 Is it even legal to have a capybara as a pet? That thing is as big as my golen retriever. I love giant rodents as much as the next girl, but I prefer guinea pigs. Wouldn't it be wonderful if we could have a 30-lb rodent? As in, a giant guinea pig, but not capybara-sized? so, this is totally off topic...but when does the next book in the KS series come out? Oh and by the way Kirsten, I saw something interesting on the news tonight. Type in Brooke Greenburg into google and check it out. How did you know about my favorite animal (besides the teddy bear, but i don't think that counts)? i'm not sure i would want one to sit on my lap though. interesting trivia fact though: they are the larges rodents in the world but i'm not sure they've found out about what's in new york's other city. AAAAWWWWWWWW!!!!!!!!!!!! he's adorable! hey, "capybaras" like the capybaras corp. from book one of kiki strike? the one that gave the irregulars 100,000 dollars each? hmmmmmmmm..............I loved that book. then again, who on this blog doesn't? It is soooo cute! I have a hamster, but it farts. cats are better! but it's still waaaaaaaaaaaaaaaay cute! AHHHH itsgonna kill us ALLLLLLLLLLLLLLL AHHHHHHHHHHH! Guinea Pigs look just like it! It is pretty cute! * But cats are still the best. Kirsten - Have you read The Mole People? It's about the homeless people who live in the subway tunnels and other (lower) tunnels in NYC. It's really good and interesting! I think you would like it. BTW-my fried Maw bought the Pride and Predijuce and Zombies book. BONUS - It also has minjas! You guys? remember the bunny (widely accepted as the cutest animal in existence) is a RODENT!!!! i will be asking for one for christmas. I used to be obsessed with capybaras! I don't even know why. It was a while ago. But I don't think I'd ever want one as a pet. They're essentially just giant guinea pigs. They live in the wild in parts of South America and are usually quite friendly. Small children can even ride on them safely. And unless I am much mistaken, they are more closely related to rabbits than rodents. Yall Need To Stop Lyin!! That THing Is An Unusual Creature That No one Should Own!Who Wants A 100 pound Rodant In there Home Pool And around there Neighborhood!Im So Distgusted,People Do Anything for 15minutes Of Fame!Next Week We Will Be Reading About It Eating Her!Remember The Monkey?U Do The Math!This Is Outragouse and Crazy!This Thing is Beyong Ugly Its Creeepy!What Did U Feed It That It Gets From 3pounds To 100 hundred!OMG!GET RID OFF IT!